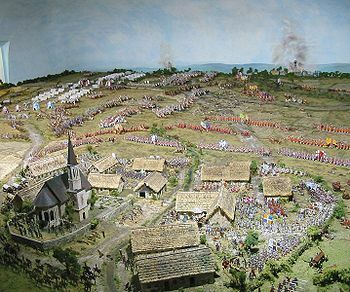 Diorama of the Battle of Blenheim on display in Höchstädt an der Donau, Germany. Unless otherwise noted, all infantry units are composed of one battalion. Leib Dragoons (three squadrons, 360 men), Colonel Ludwig von Blumenthal, succeeded by Lt-Colonel von Hacke after colonel's death in the battle. twenty-two 4-pounders distributed along the front. Higgins, David R. "Tactical File: The Famous Victory: Blenheim, 13 August 1704." Strategy & Tactics, Number 238 (September 2006). ^ A Walloon regiment that was established in June of 1684 for France. It was destroyed at Battle of Blenheim. This page was last edited on 18 May 2018, at 16:28 (UTC).